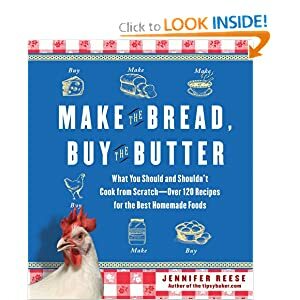 A book that I am sure will make it onto my Top 10 for 2012 is Make the Bread, Buy the Butter by Jennifer Reece, also known as The Tipsy Baker. In it she writes engagingly and humorously about her year-long project to compare the quality and cost of store-bought and homemade foods. It doesn’t always come out in favor of the homemade. As I read I was struck with the desire not only to try out many of her recipes, but to run a few similar comparisons of my own. One such comparison I wanted was on lemonade. For several years, my oldest son was allergic to corn — corn syrup being the worst offender. So, canned lemonade was right out, being primarily corn syrup with some lemon flavor and citric acid added. I moved to Crystal Light lemonade (well, the store brands, usually), which are “sugar free” — that is, they are primarily artificial chemicals rather than real sugar. As such, they have the off, lingering aftertaste of aspartame. Side note: My pastor’s wife’s trick with lemonade is to make lemonade with half frozen lemonade concentrate and half Crystal Light lemonade. If you are not opposed to either corn syrup or aspartame, this does make an excellent lemonade. It is not as sickly sweet as the all-concentrate and not as bitingly bitter as the all aspartame. However, two years ago I finally made the connection that it was the aspartame in Diet Pepsi that was causing my frequent afternoon headaches. As soon as I cut aspartame of any sort from my consumption, I rarely had afternoon headaches. Now that I’ve been off it for so long, I can’t stand the taste, either. 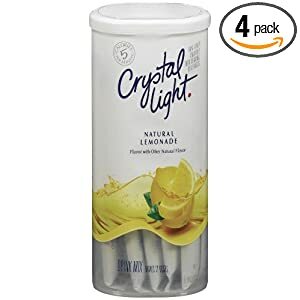 But that meant Crystal Light was right out. So I moved to Kool Aid. Lemonade is a staple hospitality beverage during the hot months here, but usually the adults sip something more….adult, and the lemonade is the beverage to appease the children. So, Kool Aid it was. My 8-year-old can even make it himself. I use 2/3 c. sugar instead of a full cup, so it’s not sickly sweet. I suppose if I were really into nutrition, I would only serve my children lacto-fermented lemonade, but even reading at the recipe makes me gag. I suppose it would seem pretty humorous — or downright offensive — to Nourishing types that I’d consider serving my children a straight-white-sugar beverage a better option than corn-syrup-laden or chemical-addled versions, but there it is. I do. I feel much better giving them good ol’ sugar. I might even add in something like “a little sugar never hurt anyone,” but I’d be afraid of the nasty emails that might ensue. So, back to Make the Bread, Buy the Butter. She has a section on lemonade. She compares freshly squeezed lemonade to Newman’s Own lemonade in a carton (not even a consideration in my book because of the cost) and concentrate. Well, sure, fresh lemonade is going to be better. Sometimes it might even be worth my while to squeeze 10 lemons for amazing lemonade. But to serve the children while the adults have their margaritas? Ah, no. 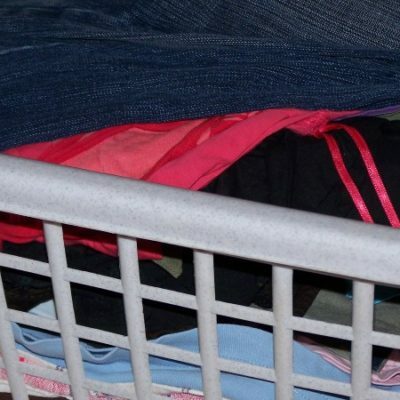 ‘Course, the adults do often take a glass themselves, and there are often pregnant ladies in our social gatherings, and sometimes the lemonade gatherings are summer lunch playdates — not exactly the setting for margaritas — so maybe I could do better than Kool Aid. 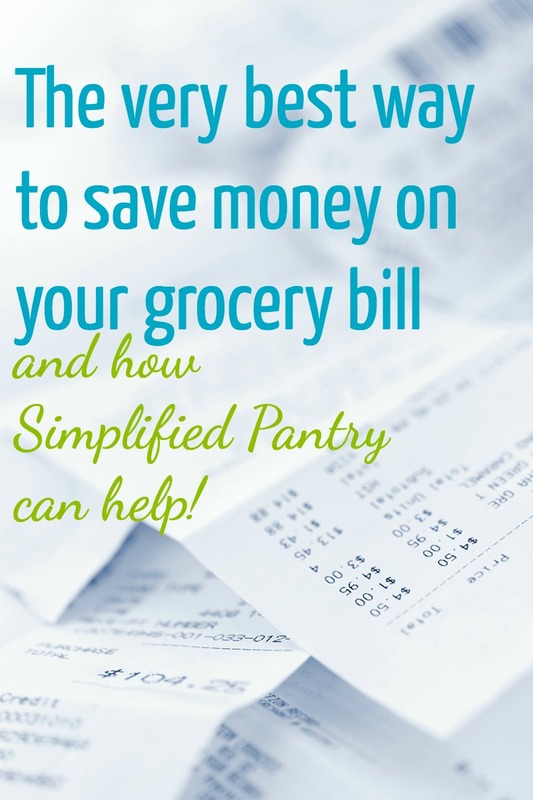 However, my personal challenge is also not to add anything to my grocery list beyond the pantry staples. Kool Aid packets aren’t on the published list, but they are on my personal list. Maybe I could experiment and find an acceptable solution that didn’t involve squeezing lemons or buying Kool Aid? That solution would involve RealLemon. It’s already part of my regular stock. I mixed up a pitcher of all three on a day when 3 friends and their kids were coming over for lunch and to play. 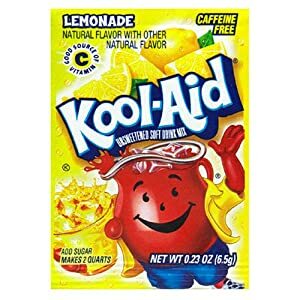 In addition to the smaller pitchers for the mommies to taste test, I made a gallon pitcher of Kool Aid lemonade for the 15 children. They were very pleased with the Kool Aid. The bottled lemon juice lemonade (made according to the directions on the bottle) was decent. It was clearly less fresh tasting than the squeezed lemons, but more tart. I and one of the other tasters preferred the extra zing. The fresh probably could have been made more tart, but it would involve squeezing more lemons. One of my tasters had the brilliant idea of mixing a glass of half-lemon-juice-lemonade and half-Kool-Aid-lemonade. That was a great combination! 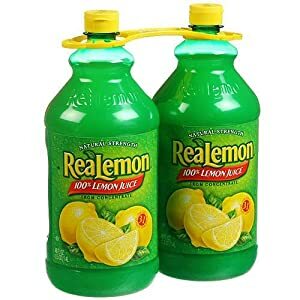 So the RealLemon version is almost double the Kool Aid version, but still, both are quite cheap. 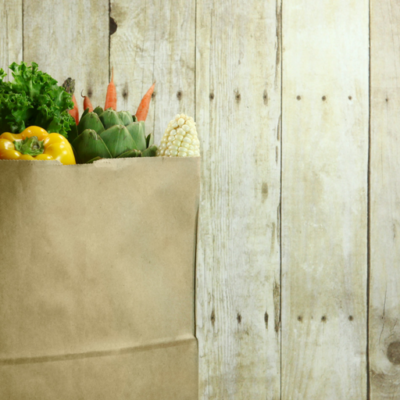 Moreover, there is the convenience of having the ingredients always on hand and being able to tick another item off my to-buy list. Plus, with the lemon juice, I could easily mix up one or two glasses instead of a whole pitcher. And the tartness and sweetness levels can be easily tweaked. Not only that, but the juice dissolves into the water much more easily than Kool Aid powder. After all, I have switched my go-to lemonade every few years so far. It’s about time for a change. I used to make up a glass of lemonade using lemon juice like that when I was a kid and wanted lemonade and none was available. 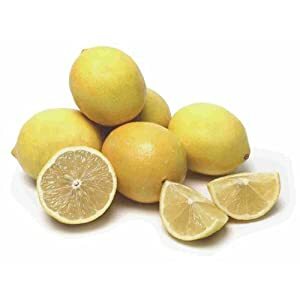 We usually buy the expensive stuff in the carton now, but I’ll have to remember to try the old lemon juice trick again next time we want some lemonade. I’d be interested to see how the concetrate compares to the others as well.